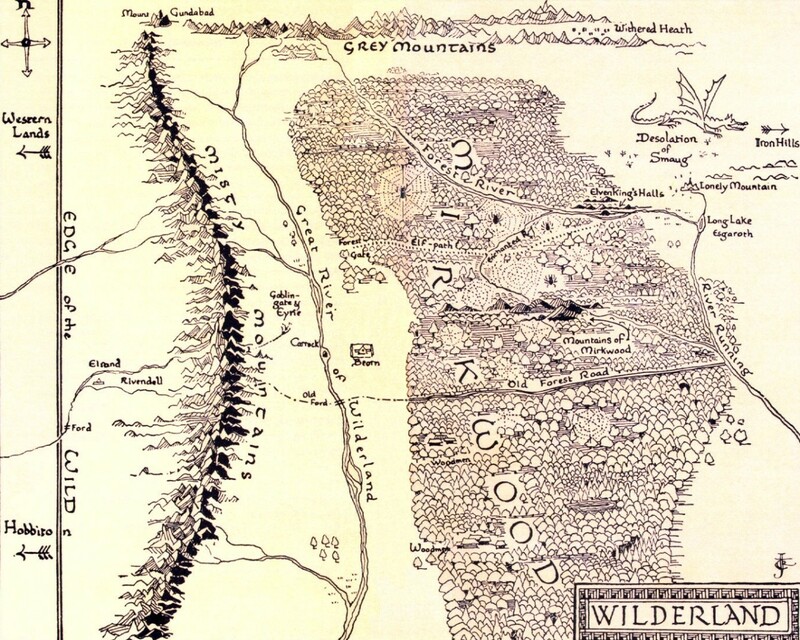 Why did Gandalf put the dwarves and the hobbit in danger of going through the cursed forest? Why did Gandalf put the dwarves and the hobbit in danger in The Desolation of Smaug by going through the "cursed forest"? Gandalf clearly said he would go another way around, which means there's another way around other than going through the cursed forest. So why didn't they just follow Gandalf the other way around instead of going through the "cursed forest"? Just to clarify: Gandalf wasn't going by another path to Erebor by himself, he was heading to Dol Guldur with The White Council, and afterwards going back to Bilbo and the Dwarves. The other way round that Gandalf mentions would take the party more time to travel, in addition to being more dangerous. Bilbo himself asks Gandalf this. "Do we really have to go through?" groaned the hobbit. "Yes, you do!" said the wizard, "if you want to get to the other side. You must either go through or give up your quest. And I am not going to allow you to back out now, Mr. Baggins. I am ashamed of you for thinking of it. You have got to look after all these dwarves for me," he laughed. "No! no!" said Bilbo. "I didn't mean that. I meant, is there no way round?" "There is, if you care to go two hundred miles or so out of your way north, and twice that south. But you wouldn't get a safe path even then. There are no safe paths in this part of the world. Remember you are over the Edge of the Wild now, and in for all sorts of fun wherever you go. Before you could get round Mirkwood in the North you would be right among the slopes of the Grey Mountains, and they are simply stiff with goblins, hobgoblins, and rest of the worst description. Before you could get round it in the South, you would get into the land of the Necromancer; and even you. Bilbo, won't need me to tell you tales of that black sorcerer. I don't advise you to go anywhere near the places overlooked by his dark tower! Stick to the forest-track, keep your spirits up, hope for the best, and with a tremendous slice of luck you may come out one day and see the Long Marshes lying below you, and beyond them, high in the East, the Lonely Mountain where dear old Smaug lives, though I hope he is not expecting you." Cutting straight through Mirkwood on the Old Forest Road would take far less time. That does not mean it wasn't dangerous, as Beorn himself notes that goblins used that road. But Beorn had warned them that that way was now often used by the goblins, while the forest-road itself, he had heard, was overgrown and disused at the eastern end and led to impassable marshes where the paths had long been lost. You can see for yourself on this map: To go North? An extra 200 miles and guaranteed goblins at the end? No thank you. 400 extra miles South and going near Dol Guldur? I'll pass. Going through Mirkwood on the Old Forest Road; goblins, possibly, but it would sure take a ton of time off the journey. North of the Carrock the edge of Mirkwood drew closer to the borders of the Great River, and though here the Mountains too drew down nearer, Beorn advised them to take this way; for at a place a few days' ride due north of the Carrock was the gate of a little-known pathway through Mirkwood that led almost straight towards the Lonely Mountain. The map of Wilderland drawn by Christopher Tolkien and included in most editions of The Hobbit. As you can see on the above map the Elf-Path is located a little more North as compared to the Old Forest Road, and would clearly take the party far less time travelling on it and through the forest, than going either North or South to avoid Mirkwood. Because unless they were terminally stupid and left the path, they were relatively safe. All they had to do was to keep following a wide path, going in a straight line, as instructed by an uber-powerful wizard who knew everything about the world and an uber-powerful werebear who knew everything about that area of the world. You'd have to be some kind of idiot to wander off the path, hoping that the wood elves (the natural enemies of dwarfs) would welcome you to their fireside and feed you. Not the answer you're looking for? Browse other questions tagged tolkiens-legendarium the-hobbit or ask your own question. Why does the company of dwarves believe in Oakenshield's leadership so blindly? How is Gimli from Lord of the Rings connected to the dwarf in The Hobbit?